Feb. 7 with an open house to gather community feedback from 11 a.m.-1 p.m. in the EMU’s Lease Crutcher Lewis Room, with light refreshments provided. Personally I’d rank this near the bottom of any list of how to best spend money, but whatever, I assume it’s just the start of what the IAAF 2021 championships are going to cost us. Rumor has it that moving this misplaced ugly money pit is turning out to be more expensive than thought, and that they haven’t yet lined up the donors for the badly needed classroom and office building. So presumably my proposal that we donate Collier House to the ESFD for a fire training exercise is back on the table. The Faculty Club is open this week at the usual times (5-8 on Wednesday and Thursday). On Wednesdays, why not pair a visit to the FC with the Jordan Schnitzer Museum of Art’s weekly extended evening hours? Enjoy some refreshments and then pop upstairs to see Monet’s painting of a snowy landscape at Giverny. It’s the perfect scene for this week’s snowy weather, and the painting (a short-term loan from a private collector) is only up for a few more weeks. Thursday we mark Bob Marley’s birthday; were “Tuff Gong” still with us, he’d be 74. Our background music will thus be all Marley all the time. Finally, a few days ago I spoke with a colleague who’s chairing a search committee. He plans to bring their candidates around to Faculty Club to demonstrate what a convivial and collegial faculty we are. All search committees should feel free to use us as supernumeraries, harnessing our cheerful vibe to the engine of recruitment! But then again so has been an above ground Parking Garage. I’m not sure UO really needs more classroom and office space, in the long term. With an applicant pool declining in size and perhaps quality — we are already seeing this — a continued gradual decline in enrollment seems likely. Oh, maybe the next recession will give us a reprieve. But in the long run, there may be excess space. Perhaps it can be rented out, to the Riverfront Research Park — remember that? — or the Knight Campus. I think the Treetops proposal has more going for it. Maybe there could be dorm rooms for the entire coaching staff. One room with beds for each sport. Perhaps they could rent it out nightly for Duck fans. A chance to sleep in the same room (not the same bed!) as Coach. I’m sure the fans and the coaches both would love this idea. afterall isn’t the Union supposed to help improve “working conditions” ? The center of campus definitely needs something with more focus and something identifiably connected to and celebrating the role of the liberal arts in higher education. The intersection of 13th and University constitutes in my mind something more like an intellectual and emotional black hole. And yet there is now a real opportunity for creating something memorable. We agree that some kind of gracious portico that encourages people to stop and to talk, to enjoy a coffee, and to interact would be a blessing for all. Creative destruction may be relevant here. A row of pillories would be eye-catching. And a good warning to those who might stray from current dogma. Now that the new unneccesary CAS admin building (yeah, there will be a few classrooms) is nearing completion, has anyone noticed how fugly this centrally located building is shaping out to be? I guess that is appropriate. Sure it’s no Jock Box, but it’s a pretty nice building. And given the economics of compensating differentials these new corner offices will mean that UO can save money on pay and benefits for our next VPEI and the Dean of the College for Unwanted Children. Hippo — unfortunately, it’s par for the course for architecture at UO, which while it may be the best in Eugene, is still pretty mediocre. 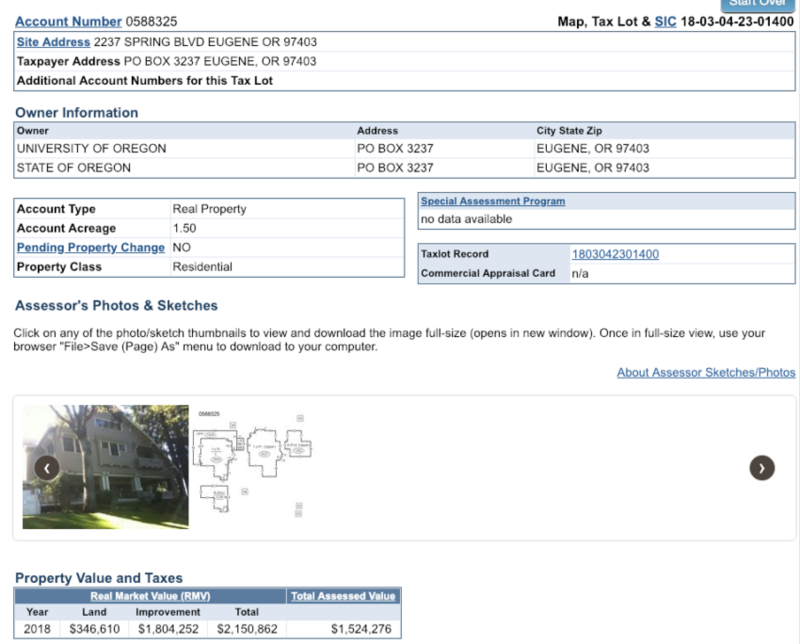 As an old saying goes, in Eugene, “make it as expensive as you want, as long as it looks cheap.” (The whole state has always be architecturally challenged.) The main exceptions at UO have been the sports wonders — the Jock Box, the Arena, probably the new track facilities — which for my money (and I don’t have that much), are striking, but kinda weird, and not all that great. For a state of supposedly such great beauty, Oregon is shockingly lacking when it comes to aesthetics, with a few exceptions. HUB: I agree Eugene is architecturally pretty much the ugliest place I have been, outside of some former Warsaw bloc countries. I also find this perplexing, given the surroundings. *gilded* not guided. Also for the historians, Warsaw Pact not Warsaw Bloc (but Eastern bloc). Friday afternoon beer posting. Hippo — hope you enjoyed your beer — and, if you re-read my post, I didn’t exactly say anything about the Jock Box etc being inspiring — maybe chalk that up to the beer too! I don’t know much about the taste of President Trump. I wouldn’t expect too much. But — he is not really representative of today’s wealth. So, I would ask, what of note has been built by Bezos — he certainly has done a good job of destroying his marriage — Zuckerberg, Gates, the Google people? Nothing comes to mind, though I haven’t really thought about this until now. I would be surprised if Apple hasn’t done something of note. HUB: Yeah, I *did* enjoy that beer. Just do a Google image search “Trump Apartment” for a taste. Re: architecture vs natural beauty: I recall Eugene’s terrible motto: “A Great City for the Arts and Outdoors”. Now is this a (great city for the outdoors) AND (a great city for the arts)? Surely not. A trip through a typical Friday Art Walk will quickly inform you of the awful level of art in this city, or try listening to the Eugene Symphony muddling its way through warn out war horses like Op 67 that the bored socialites in attendance demand make up the entire season’s programming. However, it may rank highly among all places given some fixed convex combination: like 85% outdoors and 15% arts. So I’d agree that the new buildings at the UO fit in pretty well in this company, although the tech companies do seem more attracted to the wow/weird factor. 1. This is relatively new place, and you’re seeing mainly first-generation buildings. 2. This has always been a relatively poor and unpopulated place, where much of the wealth that was extracted was shipped out of state. 3. What good buildings there were, we mainly knocked down (in Eugene). 4. Oregonians care about trees more than buildings (as Judge Hogan tried to explain to Thom Mayne as he was designing the federal courthouse).